When operating with water, much quicker heating-up periods are possible than at lower temperatures. Heating reacts quicker than with glycerine. E-heating is very effective and enables quick heating-up periods. The boiler’s outlet is 2 ½“, and the opening mechanism is mounted directly under the boiler so that there are no dead zones wherein the jam is not stirred or boiled thoroughly. The emptying mechanism can be operated from outside. Outlet taps of various sizes can be connected. The outlet spout can be easily disassembled, making everything easy to clean. The mixer features silicone wipers, so nothing can settle on the boiler wall. 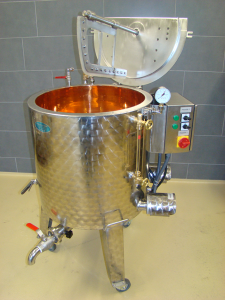 The mixer is mounted on the lid of the boiler, and can be folded out easily so that the boiler can be cleaned easily. While filing, the mixer continues to run and ensures that the fruit pieces are evenly distributed. The boiler is made from copper. This enables a better quality to be obtained. Copper also conducts heat much better than stainless steel. 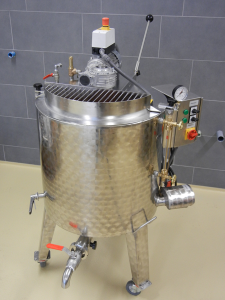 The jam boiler can be combined with a filling machine.